Real or virtual flights are displayed in real-time on a 2D or 3D map. Airports are also available on map. Statistics for pilots and/or owners are generated. Real Vessels or virtual sails are displayed in real-time on a 2D or 3D map. Satellites and space stations are displayed in real-time on a 2D or 3D map. 3D models for flights, vessels, car, trucks, satellites,... are available for 3D map. FlightAirMap is available under GNU Lesser General Public License 3 (LGPL3). FlightAirMap is a free and Open Source PHP application displaying flights, vessels and/or trackers on a map from source of your choice. FlightAirMap now support Acarsdec and VDML2dec JSON format. Cesium is updated to 1.43 and Cesium World Terrain support is added. You can now see clouds in FlightAirMap. This use METAR from the closest airports to get local real weather. A dirty archive mode is available in 2D and 3D mode. Route to airport destination now follow great circle. All flights, trackers, marine are available in a list at the bottom of the map. Data in infobox is updated in real time. 2.5D buildings support on 2D map. Offline support. No need to have Internet to use FlightAirMap. 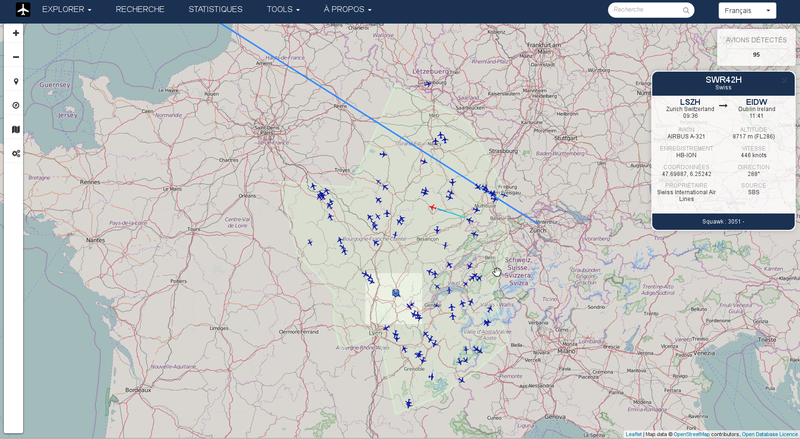 Map matching for tracker mode, with own FlightAirMap Map Matching server or graphhopper, OSMR and Mapbox support.